We are a little light on analysis this week as the Sabres inability to function as even a mediocre NHL franchise pushed us to our breaking point. We’re a few months past Festivus but we go in on every facet of the Sabres that has irked us this season and in the past. Before we haul off on the Sabres poor play we spend sometime discussing the latest in the world of women’s hockey as the NWHL is poised to take another big step forward next season. In the wake of Dan Bylsma and Tim Murray’s firings, Chris and Tyler discuss what seems to be a knee jerk reaction by Terry and Kim Pegula and what the decision means for both the short and long term future of the team. We spend plenty of time talking about the terrible things Russ Brandon does and even offer some thoughts on who the Sabres should choose to replace their head coach and general manager. Maybe we should have seen the writing on the wall when Tim Murray was given an extension in the fall. If there’s one harbinger for unemployment in the Pegula sports empire it seems as if contract extensions are it. The Pegulas have given out quite a few golden parachutes in recent years and you don’t need to look far on Twitter to find a list of all the coaches and GMs still on their payroll. You can now add Tim Murray and Dan Bylsma to that list after both were relived for their duties today. The decision comes in the wake of a disappointing season where rumors of turmoil in the locker room and poor performance on the ice fueled fan frustration in another year without playoffs. Jack Eichel’s ankle injury on the eve of the new season cast an early shadow on the year, but it was Buffalo’s poor performance coming out of the bye week – when they were sniffing a playoff position – that seemed to truly doom the season. I was asked to come step in as a guest on the 716 Sports Podcast yesterday and had a great time talking about the Bills, Sabres, Pegula and Buffalo with the group. The guys get together on a weekly basis and produce a very strong product, I highly recommend checking them out regularly. Enjoy my Ed Jovanovski reference about halfway through. Click here to listen direct. Last week, the Sabres and Canisius confirmed what many hockey fans in Buffalo had long assumed; the Golden Griffins will call HARBORcenter home starting in the 2014-15 season. With the Griffs set to become the primary tenant at Terry Pegula’s newest contribution to downtown Buffalo, the ripple effects on hockey at the local and national level should be seen sooner rather than later. The 1,800 seat facility will most definitely help the Sabres draw attention for such events like the All-Star Game, World Junior Championships and perhaps even the Frozen Four. The lodging, ice availability and attraction of the $172 million facility should bolster the resume for the Sabres and First Niagara Center. Not to mention the positive returns the Golden Griffins will enjoy in terms of exposure and on the recruiting trail. Those words will be difficult to forget. It marked the start of what was expected to be a long, happy relationship between the Buffalo Sabres and their fans. However, just over two years later things aren’t as rosy as they were on Pegula Day. Give Terry Pegula and his management team credit, they took strides towards improving things on and off the ice. They renovated the locker room, upgraded the concourses and introduced numerous new features throughout the arena in an effort to make First Niagara Center a hockey mecca. The under construction HARBORcenter project proves just that. Pegula even gave the go-ahead to empty the Brinks truck in free agency as the Sabres went out and snagged a pair of the most sought after free agents in the 2011 crop. Yet, here we are. The Sabres are languishing for a second-straight season, the coach has been fired and the hot topic of conversation now centers around booing. It seems like Buffalo has become Hockey Purgatory, not Hockey Heaven. All of the good will generated in the 2011 offseason seems to have been erased by two seasons of largely lethargic hockey and below average results. Losses on the ice have transformed to frustration in the stands as the ever enlightened fan base with the high #hockeyIQ has resorted to booing at the drop of a hat at some points this year. Now, as the Sabres draw closer to a lottery selection than a playoff spot, the question I ask is: How far gone is the mindset of Hockey Heaven? This isn’t about the incessant boos the rain down on the team almost every night. Booing isn’t a subject I care to delve into as fans will always have the liberty to do whatever they please with their tickets; particularly when the product they’re paying to see is underperforming. Of course, that doesn’t mean that piling on a group of players who only have a partial responsibility in the current situation doesn’t seem like the best way to spend that energy. Perhaps if they at least waited until the end of a particularly horrid period, no need to jump on a team after one or two shifts in a game they’re winning. In just over three months, Terry Pegula has tossed the Sabres hat in the ring on the Webster Block, donated money to finish landscaping work at Canalside and will now contribute to an alumni plaza outside of First Niagara Center. This tweet from WGRZ kicked things off prior to the official announcement that a press conference will be held tomorrow to unveil the plans for a full alumni plaza. This is something I had given thought to back in the winter after the second blog summit. In addition to paying tribute to the team’s most famous trio, I would suspect there will be a statue for each of the franchise’s retired numbers. There will certainly be space to honor the Knox family and those who helped bring the Sabres to buffalo. The Sabres are in a unique position because of the design of the arena. The inclusion of the massive public plaza has not only provided space to throw big gameday parties, it will also provide more than enough space for a number of different statues. Off the top of my head I can count the French Connection, Knox brother, Pat LaFontaine, Danny Gare, Tim Horton and Dominik Hasek as those who will have statues within the next few years. I would venture a guess that RJ and Ted Darling will each get their own down the line as well. UPDATE: The Sabres press conference detailed a number of intricate details for the project. 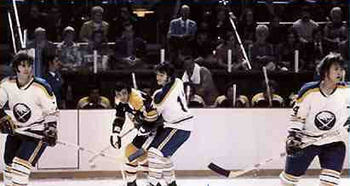 This includes the picture the statue will be based upon and the inclusion of every player ever to don a Sabres sweater. The additional players will be included on plagues on the brick pillars already in place. It would seem to me that the plan only includes space for the French Connection statue at this point. Assuming the statue will be the focal point in front of the raised walkway, there will be plenty of room in the rest of the plaza for additional statutes, should the organization choose to build them. The potential of this idea goes so far beyond anything else done by any other team simply because of the space afforded to the franchise in the plaza. Certainly tomorrow’s announcement will provide the rest of the details and perhaps some super cool, Tielman-proof renderings. Terry Pegula is certainly proving that he could become a driving force in developing the area around FNC in the coming years. It is something the city of Buffalo has been without for a long time.